It’s summer and the kids are home. I think sometimes parents feel a bit too obligated to fill in the long summer hours keeping our kids entertained with trips to the zoo, museums, splash pads, and anywhere else they might want to go. But with some creativity, a bit of assembly, and and team work, there really is no need to leave your backyard. Put the keys and wallet away, and read on for 11 fantastically fun ideas for outdoor games that’ll keep your whole family entertained all summer long! #9 will be a “smash” for sure! You’re family won’t be on strike with this fun idea… Use the porch, deck, sidewalk, or driveway to make your very own bowling alley. All you’ll need is a flat surface, empty water bottles, and a ball. 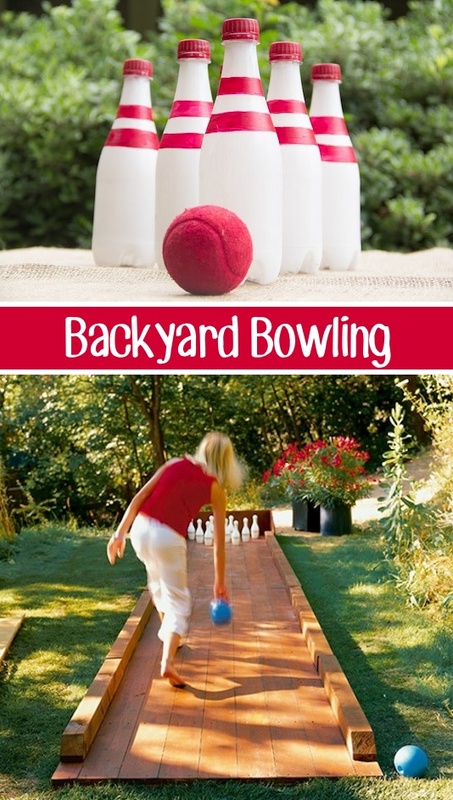 There’s not a moment to spare… roll over to Listotic to learn more about making your very own backyard bowling game. 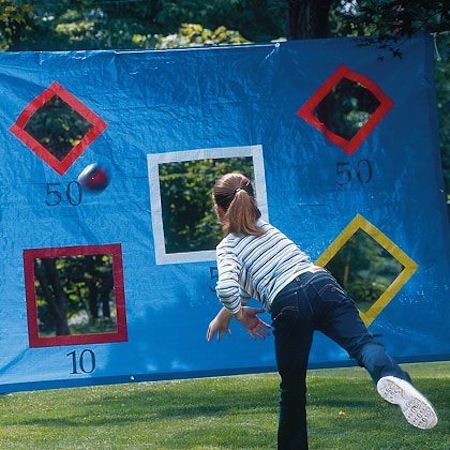 Hit the target of fun with this passing practice tarp. Simply cut holes of various sizes in a tarp, line the edges with duct tape, and assign points to each hole. Aspiring athletes can practice football, soccer, pitching, and more for a summer of friendly competition right in your own backyard. 3. Water You Waiting For? Have a splash of a time this summer with squirt gun water races. Pull out some string, plastic cups, tape, and scissors for a simple way to beat the summer heat. 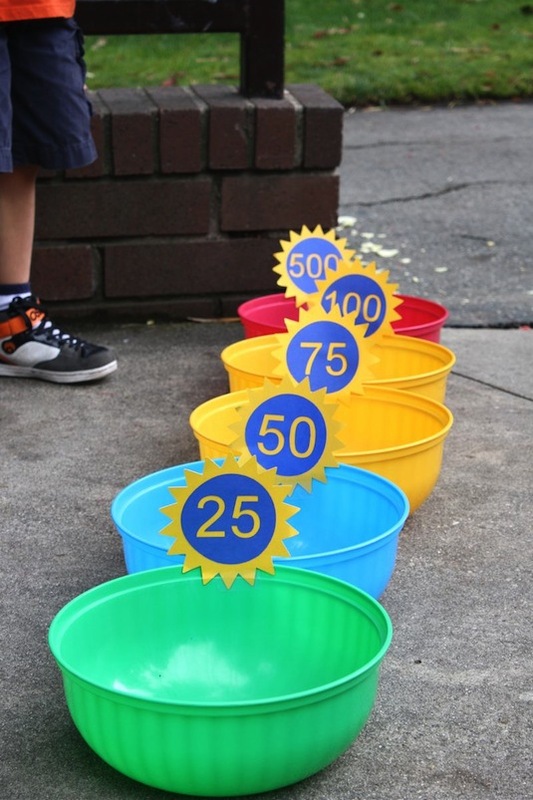 Water you waiting for?… No need to wait to set this backyard game up today! Your kids will definitely pop on over to this backyard game. Set up a balloon dart board using a wood board or cardboard stand. 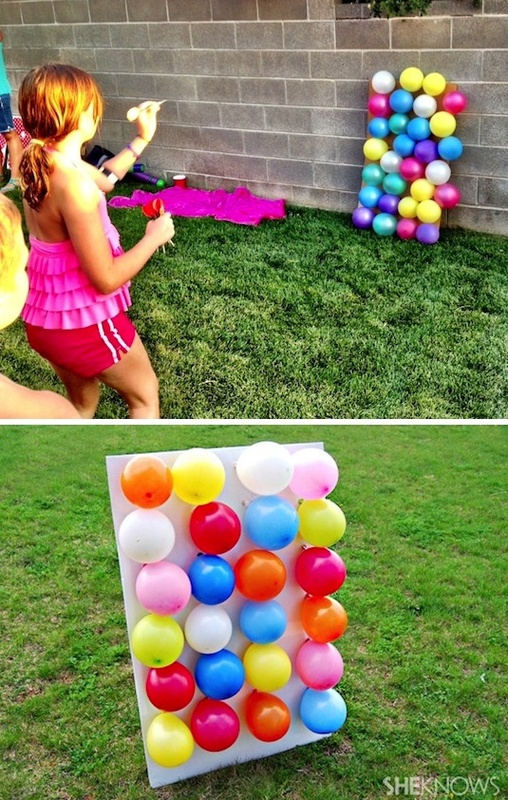 Then just tape or staple some balloons to the board and you’re ready to take aim. Fill the balloons with small dollar store prizes for an extra pop of excitement. 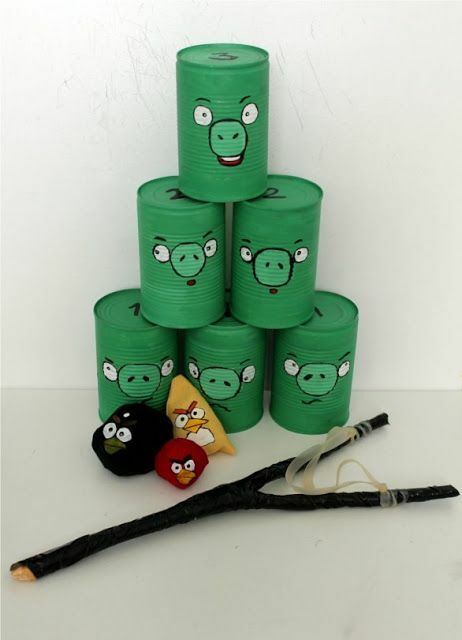 Set up a game of bean bag toss using nothing more than dollar store bowls, self-made point value labels, and a bean bag or similar small, soft toy (you could even roll up a pair of socks). Increase the space between bowls for added tossing trickiness. Cool beans, man! Real croquet is always fun but can be a bit too challenging for little hands. 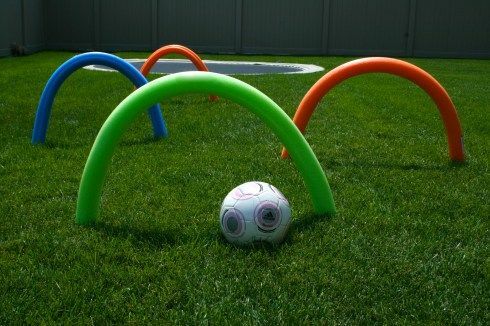 Set up your own larger soccer version with pool noodles and wire hangers. Who won’t get a kick out of kick croquet?! It doesn’t take a genius to use your noodle for this backyard idea. Construct an activity center out of pool noodles for hours of fun. Be creative with your games by having javelin throwing competitions, jousting tournaments, or even high flying quidditch matches. 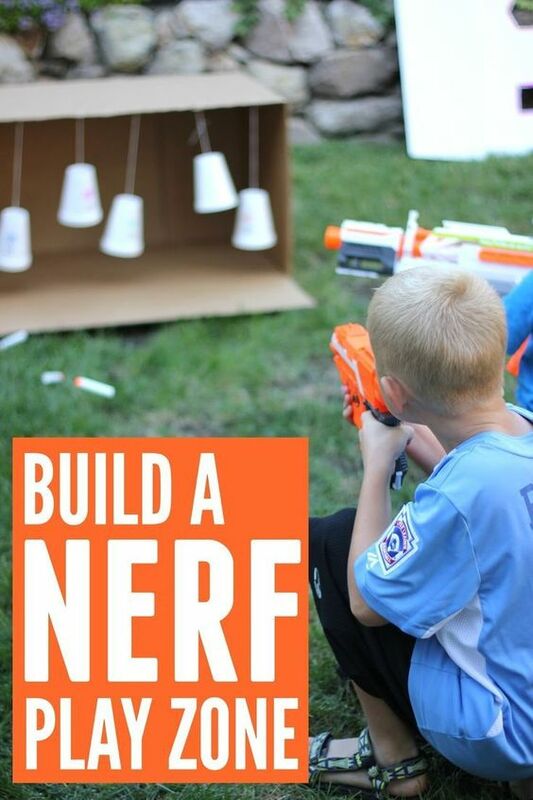 Build a backyard Nerf arena. It will require some Nerf guns and station assembly, but this is one backyard activity your family won’t be able to get eNERF of! Give each target a point value, and the player with the most total points after going through the entire arena wins. We also sometimes play against a timer. It has shocked me just how much my children get into the game and how much we cheer and root for one another. Go figure, but I’ll take team work, togetherness, and laughter any day over boring summer nights stuck behind different electronics and devices! 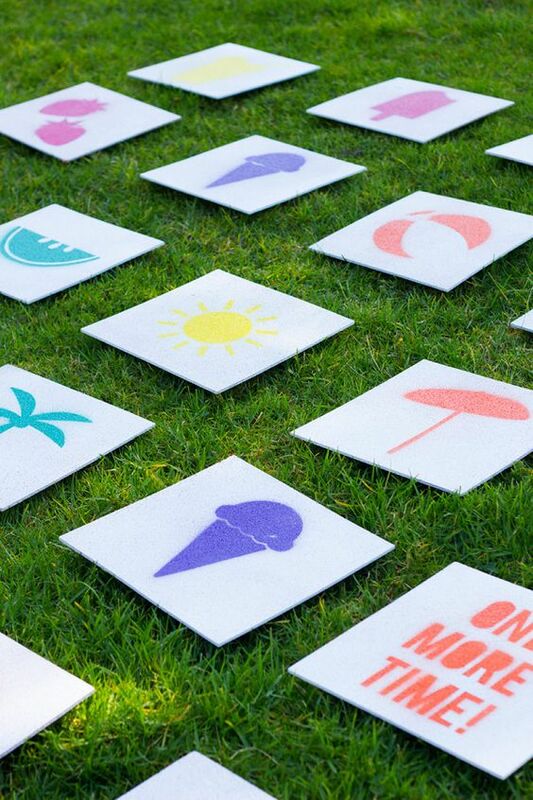 Boredom is no match against this backyard matching game. Use cork tiles or wood panels to create enough matches that you can lay them in an even array on the lawn. Card board works too but will be more easily blown away by the wind. Let your children help with making the tiles too by having them use stencils. 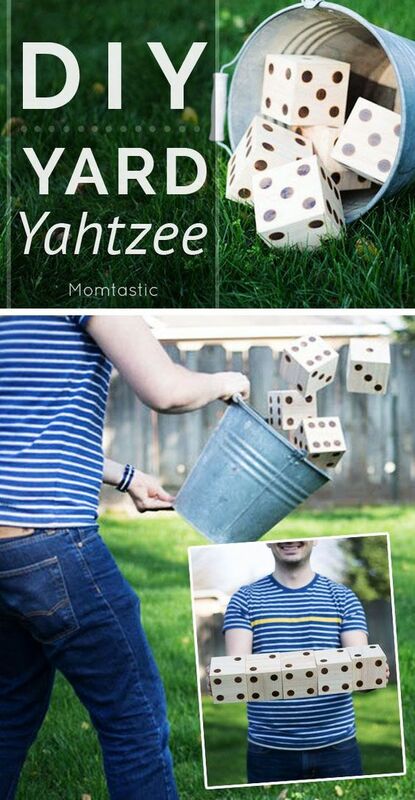 Play a giant game of Yardzee with ball-sized dice. Children might need help remembering how to make each category, but my kids have loved playing Yahtzee since they were as young as 7 or 8. It really is a game you can play as a family. To make the dice, roll on over to Momtastic for instructions and a list of materials. You can also buy them on Amazon and Oriental Trading (we use their jumbo set). No question you’ll have a full house with this backyard activity!